Leonard Everett Fisher is an American artist best known for illustrating children's books. Since 1955 he has illustrated about 250 books for younger readers including about 88 that he also wrote. Fisher was born in the Bronx borough of New York City in 1924. Raised in the Sea Gate section of Brooklyn, he began his formal art training with his Brooklyn-born father, Benjamin M. Fisher, a designer of naval vessels, who contributed to the construction of Simon Lake submarines in Bridgeport, Connecticut, and such US Navy fighting ships as the USS Arizona, USS Honolulu, and the USS North Carolina" -- all designed, built, and commissioned at the Brooklyn, New York Navy Yard (1913-1937). Between 1932 and 1942, Leonard Everett Fisher continued his training at the Heckscher Foundation (NY), with Moses and Raphael Soyer (NY), with Reginald Marsh at the Art Students League of New York, and Serge Chermayeff at Brooklyn College. He is a graduate of Yale University (1949, MFA 1950). 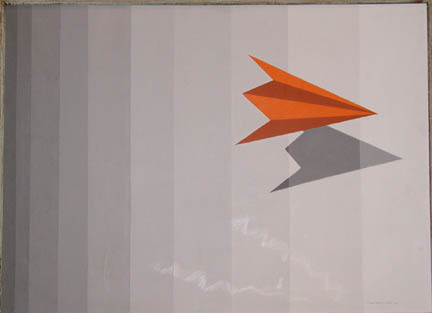 Fisher, Leonard Everett, “Fly by IV,” Westport Public Schools Digital Collections, accessed April 23, 2019, https://collections.westportps.org/items/show/493.